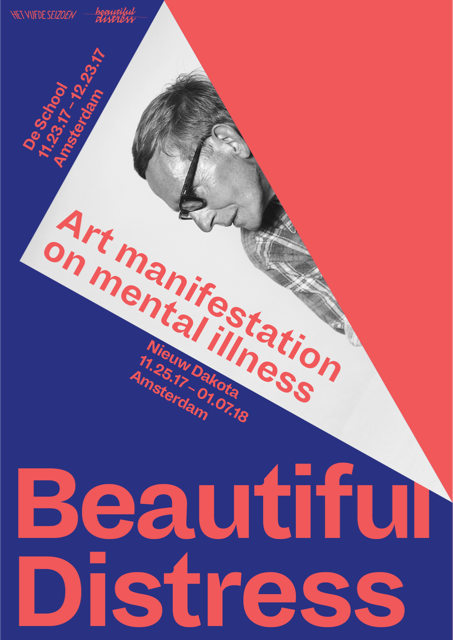 We would like to invite you to the Beautiful Distress Conference on art, mental illness and stigma, which will take place on Thursday December 7, 2017 at De School, Doctor Jan van Breemenstraat 1,1056 AB Amsterdam. During this interactive conference, 200 participants from various interest groups – artists, patients and their families, mental health care professionals, policy makers and the general public – will exchange ‘best practices’, devise new solutions, and formulate recommendations to break taboos and enhance the understanding of and compassion for those who deal with mental illness. The conference is part of the Beautiful Distress Art Manifestation on Mental Illness, an initiative of the Fifth Season Foundation and the Beautiful Distress Foundation. Together with artists, a translation is made of the world of psychiatry to a large audience that does not come in contact with mental illness or psychiatry on a daily basis. In addition to this conference, the Beautiful Distress Art manifestation consists of a manifesto, a two-part exhibition showing the works made in the residencies and various side programs, focusing specifically on young people. The views and observations of the artists, resulting from their intense experiences with patients and staff, will be bundled in an “Artists Manifesto”, which will be offered to all participants and form the starting point for the discussions. The program starts at 9am and ends at 5.30pm. Chairman of the day is Jim van Os, Professor, Psychiatrist, and Chairman of the Brain Division at the University Medical Center Utrecht (UMC Utrecht), the Netherlands. In the morning, various speakers will discuss their approach to mental illness, art, and stigma from different angles. Workshops will take place in the afternoon with representatives from all the interest groups. Based on the artworks in the exhibition, participants will be asked to share their experiences and best practices in order to come up with new solutions to ensure a better understanding of and compassion for those suffering from mental illness. We will ensure that there is enough time for questions and discussions. Welcome by the Day Chairman Jim van Os, professor, psychiatrist, and Chairman of the Brain Division at the University Medical Center Utrecht (UMC Utrecht), the Netherlands. * The themes of the workshops are derived from: 'Conceptual framework for personal recovery in mental health: systematic review and narrative synthesis' Mary Leamy, Victoria Bird, Clair Le Boutillier, Julie Williams and Mike Slade, The British Journal of Psychiatry (2011), 199, 445–452. Read more here. The recommendations resulting from the conference will be assembled in a publication that will be presented to policymakers in government and mental health care. Initiatives instigated and results obtained based on these initial recommendations will be discussed at the next conference. The conference language will be primarily Dutch. However, the keynote speech will be in English, and the afternoon workshops will be both in Dutch and in English. HBO/University students pay €50 per person. (Former) patients and family pay €50 per person. Further reductions are possible if necessary! Please make a request on your registration form. Would you like to join us? Sign up now. More information about the program will follow upon registration. The NVvP has accredited the Conference with 4 points. The Nursing Specialists Register has already accredited the conference with 6 points. Accreditation is pending with the Quality Register V&V and with the FGzPt. The Beautiful Distress Art Manifestation on mental illness is the first in a series of international events. Visit www.beautifuldistress.org/artmanifestation for more information.